← Law enforcement agencies have invented a number of the techniques, including blood-spatter and bite-mark analysis. At Monday’s hearing of the Texas Forensic Science Commission, the ABFO supporters of their brand of “magic” used their trump card of protecting child victim’s of violence. See here. 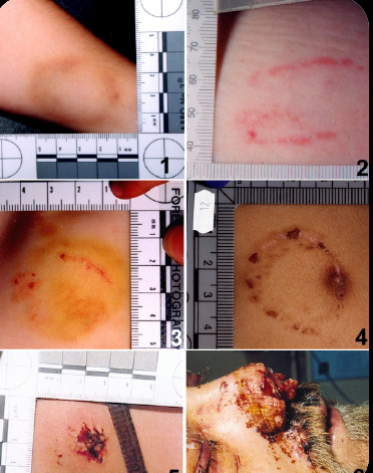 Bitemark injuries on children are not uncommon, yet this group offers no solutions to the Commission regarding how their child abuse opinions will be any different than their well documented past bitemark disasters resulting in wrongful arrests and convictions. These cases are approaching 30. As a clinician, it baffles me and apparently the Commission as well, that the pro-bitemarkers can claim any credibility without a scintilla of supporting empirical research. Especially no research regarding child abuse bitemarks. This absolutely follows the plot-line of Shaken Baby Syndrom cases from over the decades. I have personally, along with Professor Iain Pretty who testified to the Commission, researched and published in the Journal of Forensic Study, a study of 49 bitemark cases, one half of which went to court. This could have been easily reproduced by the ABFO. As usual, nothing happened as they prefer a more “un-scientific” approach to what they claim as fact. The child abuse cases in our study showed the same lack of detail as did the adult cases that later became DNA exonerations. Both types, child and adult, fell into the lowest detail categories on the top row. Categories 1 and 2. Here’s a lecture on the subject. . This entry was posted in criminal justice reform, wrongful convictions and tagged American Academy of Forensic Science, AMERICAN BOARD OF FORENSIC ODONTOLOGY, bitemark evidence, falsified evidence, forensic examiner error, junk science, Miscarriage of justice, misidentification, wrongful convictions. Bookmark the permalink. Hello Michael, great comments as usual, how do I access the lecture power point that you have an illustration of on this post?